This special edition DARK NeoMagnetic Cube comes in a sturdy meal gift box featuring a display window. The box feels heavy and solid, as soon as you hold it you feel that you are holding a quality product. What you get is the same quality Neodymium spheres that we sell in our other listings but in this gift box they are arranged in a rectangle. You still get 216 triple coated N38 neodymium spheres and of course you can make a cube with them. This item was custom made for us, you won’t find better quality anywhere else. These truly make amazing gifts for people you like or for yourself. Coating: High quality triple coating (Nickel, Copper, DARK Nickel) offers the best protection available against chipping and corrosion. 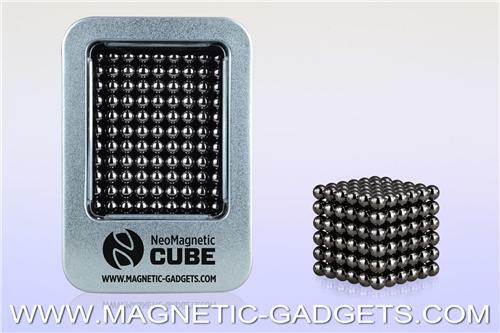 The coating on low grade Magnetic Cubes will chip quickly, exposing the neodymium core which will soil your hands. Our Magnetic Cubes were custom made to meet the highest quality standards. The coating on these NeoMagnetic Cunbes will last for a very long time. It won’t leave you with dirty hands and the feeling that you’ve wasted money on a low grade item. Simply put: our Magnetic Cubes will last longer and perform better than most cubes on the market.